To keep your automatic system in the best shape possible, our technicians will perform a wide range of tasks, including fastening and tightening loose nuts and bolts, adjusting various parts and testing different automatic features. This will ensure that there are no lurking problems waiting to manifest and that the strain that's put on the system is reduced. Since these are arguably the most important parts of your door (aside from the panels, naturally) they must be checked first, and thoroughly. After making sure they haven't developed any deformations, we'll test their tension and adjust it if necessary, to keep the door in perfect balance; then we'll lubricate them to help reduce their working stress. If we do find that spring replacement is required, we'll do so on the spot. To prevent a scenario in which the door closes while you, your family members or your car are blocking its path, we will test the opener's safety features; namely, the photo eyes. These electric safety sensors are what allows the motor unit to recognize an obstacle and keep it from closing the door on it. Misalignment of these sensors can lead to serious injuries, which is why making sure their lenses aren't damaged and that they're working correctly is so important. Every single one of your door's hardware parts will be carefully examined and treated accordingly. If we find bent tracks we'll straighten them, if the cables are frayed we'll replace them. Lubrication will also come into play, as we'll make sure that the hinges and rollers are generously applied with it to reduce their working noise and make the panels move more smoothly. If you're a local homeowner who's looking to get the most out of your automatic system, our experts at Garage Door Repair Bluffdale will be happy to help. You can call us or simply use our online system to schedule an appointment and we'll send our technicians out to help you out with whatever you need, whether it's maintenance, emergency repairs or anything else. If your garage door is in need of TLC, speak to our local experts – we have the experience to advise you on how to take care of your door and can look after any installation or repair need you have. Just browse our site or get in touch with us to learn more about the way we work! Our technician will contact you before arriving. Until then, feel free to browse our website! 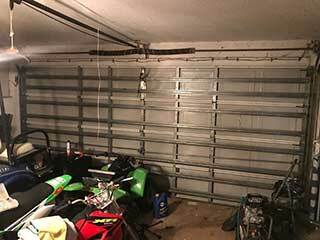 Garage Door Repair Bluffdale is at your service!